[quote=“Meximelt”]How did you track the pins from motors say back to the controller w/o errors? I did use a black and red permanent marker to put dots on each wire. OK Got it - I saw dots here and there, but tucked away so didn’t know you had an actual reference going! Very cool! Put the motor at the top it works better for so many reasons (just rearange the standard parts). You can run two motors on the Z axis by wiring them in parallel. You can either make a Y cable or simply solder the motor wires together. Just connect the same color wires from each motor together and then to the controller board as normal. 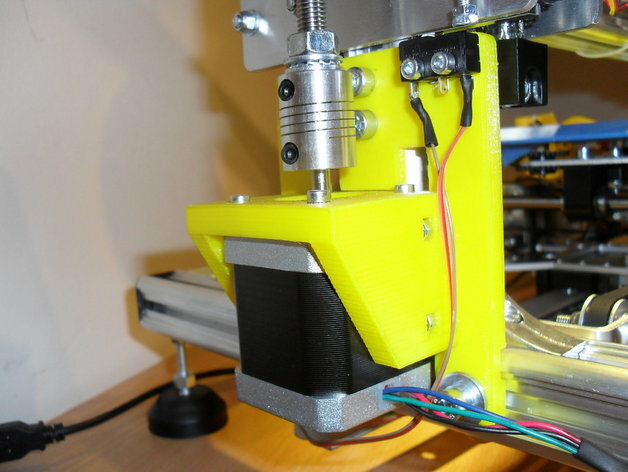 Some 3D print controller boards even have a pair of motor connectors for the Z axis output that are connected in parallel. In this arrangement, both motors are driven off of a single stepper driver circuit. This will generally work OK because the motors are each moving only half of the physical load. [quote=“Dr. Vegetable”]You can run two motors on the Z axis by wiring them in parallel. You can either make a Y cable or simply solder the motor wires together. Just connect the same color wires from each motor together and then to the controller board as normal. 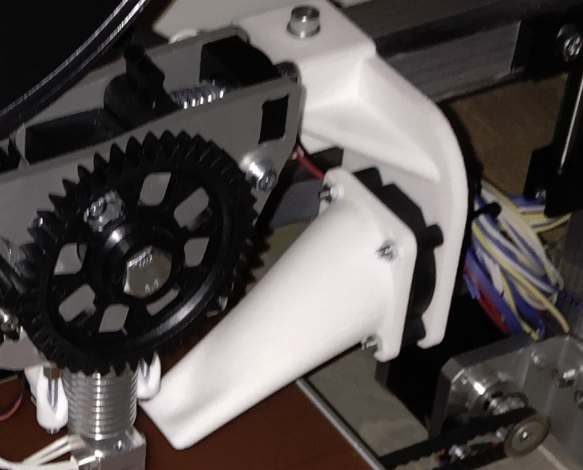 Some 3D print controller boards even have a pair of motor connectors for the Z axis output that are connected in parallel. O.k. i try that. In the manual the stepper-value must be set to 0.425 vdc. Is this enough for the 2 motors? I usually set all my driver reference voltages to 0.55v, but they do get hot. I saw a dual z-axe mount on youtube on witch one had a motor on the left. The richt z-spindel was connected by a 2G-belt to the left spindel. So they turn on one motor totether. I do think a 2-motor z-axe system is much more elegent. Resenty i did fry my controllerboard when i made a new printbed of 4 mm thick aluminium that does not bent. I placed the heatbed right ontop of the aluminium plate without the karton plat between them. I did not realise that the printer still was on so it didn’t do anyting anymore. So the lesson is: Your thermistor can fry your controllerboard if shorted. Now i did rout the aleminium plate 1,5 mm away where the thermistor is on the heatbed and with the carton plate i have about 2 mm space between the thermistor and the aluminium plate. So you can imagine that i check every connection twice before turning the printer on again. So if you ask yourself why i ask some questions twice is becauce i rather do that then fry someting again. I’m glad i did manage to get the Extra Large Full Graphics Smart Controller working. I also installed the E3D v6 with the E3D Titan. I’m now rewiring all cables. I must test everything ofcaurce. If somewone can answer my questin on how to connect a thermocouple to my controllercard i would be very happy. It consist of a External thermocouple board & Thermocouple K welded tip (glass fiber). see [size=120]https://reprapworld.com/products/extruder/temperature_control/thermocouple_k_welded_tip_glass_fiber/[/size] & [size=120]https://reprapworld.com/products/external_thermocouple_board_v1_0/[/size] for more info. In regard to the below, how did you mount the E3D Titan onto your frame? Do you have pictures and STL files if you made any additional brackets? The E3D Titan comes with a 3D printed motor mount. 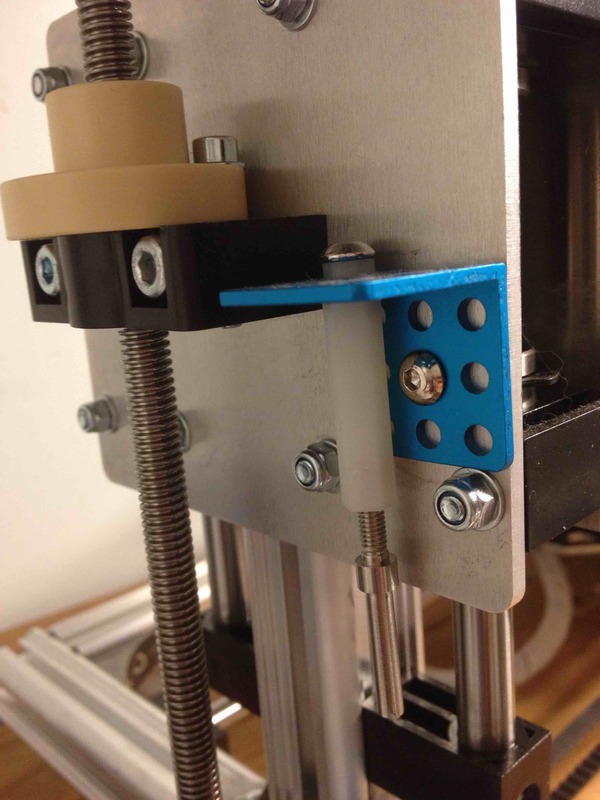 One side has 2 rows of holes to mount the extruder somewhere on your printer. In front of the motor is the drivegear for the fillament. The whole extruder is smaller then the motor it self. To stenghten the attachment-holes i placed 2 aluminium strips on top & below the strip (with the 3 holes) so it doesn’t bent when titening the screws to the frame. This is not the final version. Because i cannot print at the moment i cannot print any holders. When the printer is running correctly i’m planning to make the printer nicer. b.t.w. The fan that comes with the K8200 uses 100mA. To my knowledge that’s the maximum the controllerboard can handle. I use 2 noctua fans that use each 50mA. so i can use 2 fans, one on the left & one on the right. I must print some fanducts for them. I like the Ultimaker style fanducts. Surely this printer is a K8200 ! Don 't be fooled by the plexiglass hood: both the mechanics and electronics are completely based on the Velleman kit, only the E3D extruder is foreign. I was also fooled by the looks of it. Very nice mods, this one looks better than the original. BTW, I’m also a proud owner of K8200 and I’m lovin’ it! Hi Fitchie and all other readers! I really like the modifications you have done on your K8200 printer. It looks amazing while functioning very well, printing high quality models and all. I am building myself a K8200 printer as well soon. Even though i had written down a lot of tricks and modifications possible from this post, I still have a lot to learn. Can you guys give me any advice or top tips in building the K8200 printer? It will be a great help to my progress. Really appreciate it. 1.) 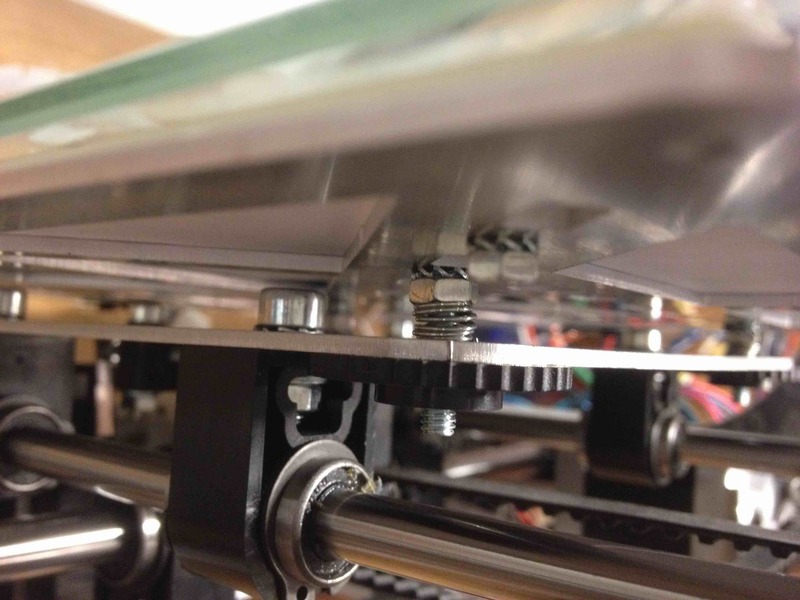 Get a borosilicate glass plate to top your heat bed. The flat (planar) build surface will save you a lot of heartache! 2.) The adjustment screw for the Z-axis limit switch is a bit flimsy. You will want to modify this to be more solid, for better repeatability. 3.) I put four small compression springs over the support screws for the bed, and only installed one thumbwheel at each corner. This makes bed leveling easier, as you don’t need to tighten the lower thumbwheel against the upper one. 4.) If you have a good supply of stranded wire, you might consider using it in place of the ribbon cable provided in the kit, although this is not strictly necessary. Take your time building it, and make sure everything is square before you tighten any bolts. Those are the most important enhancements during your initial build. One last piece of advice: Eventually you will want to upgrade the extruder. Many folks here, myself included, swear by the E3D extruder, but fitting one onto your K8200 is a major project. If/when you do, you will probably find it best to switch to using 1.75mm filament instead of the 3mm stuff you are using now. So don’t buy too much 3mm filament right away! Enjoy the build, and happy printing! When setting the reference voltage for the stepper drivers. Set them to 0.55 instead of 0.425 in the manual. Do not go over 0.6 as this will cause them to over heat and do crazy things. Use the software from this link version 0.95F This has the drivers and ini files in it so you can skip that part of the manual. Thank you so much Dr_Vegetable and Wrong_Way. Your help is very much appreciated. I’ll be sure to upload my assembled printer here once it is ready soon. Hopefully i can also ask you guys some more questions along the way. I found some old pictures of the two modifications I mentioned. Thanks for posting the pictures mate. Thanks for the terrific thread. I went through it once and be coming back more than once for more detailed infos. (1) is it better than the one of v5-10? (2) Can you post the stl files to it as well? Thanks for posting the terrific thread.